Spring means that the garden centers are packed with people, and car trunks are packed with plants. Everybody has dirt on their knees, dirt under their nails, and are excited about gardening. To make certain that this excitement yields positive results, let's discuss the basics of spring planting. Installing new plants and having them grow successfully is not difficult, nor is it as complicated as some would have you think. Is it as easy as just digging a hole and setting the plant in? Yes, it certainly can be. I won't get into bed preparation, as I have covered that in previous articles that are still available. When B&B plants are stored in the nursery for extended periods of time it becomes necessary to re-burlap them if the bottom starts to rot before the plants are sold. If the plant that you buy has been re-burlaped it is possible that there could be nylon strings between the two layers of burlap, check the stem carefully. As long as the nylon string is removed from around the stem of the plant, it is actually harmless around the rest of the ball, and you do not have to remove it. Is the root ball wrapped in genuine burlap, or imitation burlap made of a non-biodegradable plastic material. Genuine burlap will rot quickly underground and does not have to be disturbed before planting. If you're not sure or suspect a poly type burlap you don't have to remove it completely, but should loosen it around the stem of the plant and cut some vertical slices around the circumference of the ball. Now here's the critical part. What kind of soil are you planting in? If your soil is heavy clay, I highly suggest that your raise the planting bed at least 8” with good rich topsoil. If you can't do that for some reason, install the plant so that at least 2” or more of the root ball is above the existing grade and mound the soil over the root ball. Keep in mind that plants installed this way could dry out over the summer, but planting them flush with the ground in heavy clay can mean that the roots will be too wet at other times of the year. The “experts” suggest that when planting in clay soil you dig the hole wider and deeper than the root ball and fill around and under the plant with loose organic material. That sounds like a really great idea doesn't it? Some of these experts also recommend that you dig the hole extra deep and put a few inches of gravel in the bottom for drainage. Where do you suppose they think this water is going to “drain” to? Keep in mind that most B&B plants are grown in well drained soil. That means that the soil in the root ball is porous and water can easily pass through. Now imagine if you will, a root ball about 15” in diameter, setting in a hole 30” diameter. All around and under that root ball is loose organic matter. Inside of that root ball is porous soil. Now along comes Mother Nature with a torrential downpour. There is water everywhere, and it is not going to soak into that hard packed clay soil, so it is just flowing across the top of the ground searching for the lowest point. When it reaches our newly planted tree surrounded by loose organic matter, it is going to seep in until the planting hole is completely full of water. (Remember my article on getting rid of standing water and the French drain system?) By using this planting technique we have actually created a French drain around our poor little plant that can not tolerate it's roots being without oxygen for long periods of time. Because the bottom of this hole is clay, even though we've added gravel for drainage, there is nowhere for the water to go, and this plant is going to suffer and likely die. If you can not raise the planting bed with topsoil, and are planting in clay soil, I recommend that you install the root ball at least 2” above grade and backfill around the ball with the soil that you removed when you dug the hole. Backfilling with the clay soil that you removed is actually like building a dam to keep excess water from permeating the root ball of your newly planted tree. The plant is not going to thrive in this poor soil, but at least it will have a chance to survive. No matter what kind of soil you have, be careful not to install your plants too deep. They should never be planted any deeper than they were grown in the nursery. Planting too deep is a common problem, and thousands of plants are killed each year by gardeners who just don't understand how critical planting depth is. 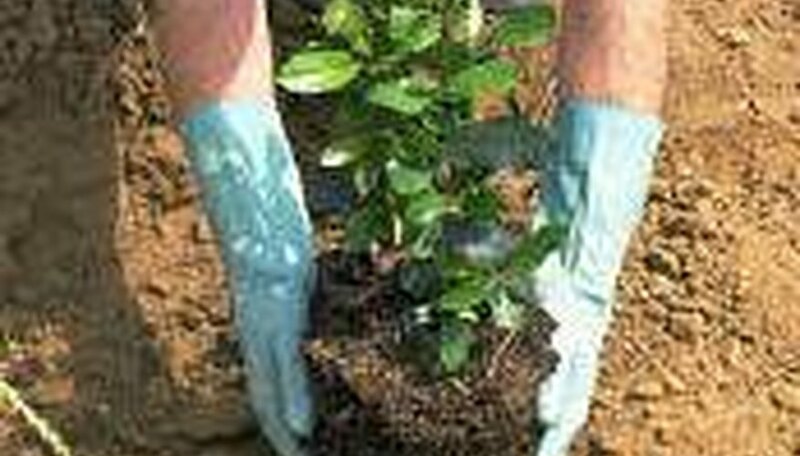 Staking newly planted trees is always a good idea. If your new tree constantly rocks back and forth when the wind blows it will have a very difficult time establishing new roots into the existing soil. Stabilize the tree with a stake. You can use a wooden stake, a fence post, or for small trees I often use 1/2” electro magnetic tubing, (conduit), available at any hardware store. You can secure the tree to the stake with a single wrap of duct tape. In about six months or a year the sun will dry the glue on the duct tape and it will fall off. Check the tape to make sure that it has fallen off. You don't want to girdle the tree with the tape. Container grown plants are much easier. Follow the rules for depth of planting as described earlier. Before gently removing the plant from the container check the drain holes in the bottom of the container for roots that might be growing out the holes. If so cut them off so they will not make it difficult to get the plant out of the container. The easiest way to remove the plant from the container is to place your hand over the top of the container and turn it completely upside down and give it a gentle shake. The plant should slide right into your hand. Examine the root mass as you hold it in your hand. Sometimes when plants have been growing in a container for a long time the roots start to grow in a circular pattern around the root mass. This is not good, and you should disturb these roots before planting so you can break this circular pattern. You can take a knife and actually make about three vertical slices from the top of the root mass to the bottom. This will stimulate new roots that will grow outward into the soil of your garden. Or you can just take your fingers and loosen the roots that are circling the root mass and force them outward before you plant them. What about fertilizer, bone meal, peat moss, and all those other additives they are going to try and sell you at the garden center? Raise your planting beds with good rich topsoil and forget about the additives. Be very careful with fertilizers, they can do more harm than good. I landscaped my house 12 years ago and I haven't got around to fertilizing the plants yet, and have no intention of doing so. They look great. As far as bone meal and all those other soil additives are concerned, don't get too caught up in all that stuff. The only thing that I know for sure is that they will make your wallet thinner, but I don't think you'll see a difference in your plants. Did I mention planting in good rich topsoil? About the AuthorMichael J. McGroarty is the author and owner of the popular gardening website http://www.freeplants.com Stop by and sign up for his free gardening newsletter.